The Old Homestead was the most popular house in Cripple Creek, Colorado during its heyday. Pearl de Vere, its famous madam sometimes charged as much as $1,000 to entertain the men of the district. Today, it continues to stand as a museum. By Kathy Weiser-Alexander. At the time, Victorian prudence had long taught “decent” women that the sexual act was solely for the purpose of bearing children. She was taught that she shouldn’t respond in any way and that her man should be indulged from time to time, but best to be avoided whenever possible. Virtually every Old West town had at least a couple of “shady ladies,” who were the source of much gossip. Sometimes she would “hide” behind the chore of taking in the laundry, as a seamstress or running a boarding house. But, often she would flaunt her profitable bordello by prancing through the streets in her fine clothing, much to the chagrin of the “proper” women of the town. Such was the case of Pearl de Vere of Cripple Creek, Colorado. Some high-class courtesans often demanded as much as $50 from their clients; however, rates on the frontier generally ranged from $5 at nicer establishments to $1 or less for most ladies of the night. Sometimes they would split their earnings with the madam of the parlor house, while others paid a flat fee per night or week. 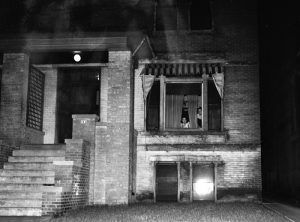 As in most occupations, there was a pecking order, with the women who lived in the best houses, at the top, and scorning those who worked out of dance halls, saloons or “cribs.” However, the majority of prostitutes did work out of parlor houses, the best of which looked like respectable mansions. 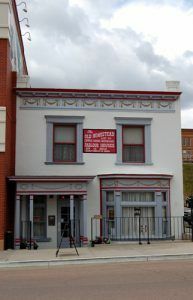 To advertise the building’s true intent, red lanterns were often hung under the eaves or beside the door and bold red curtains adorned the lower windows. 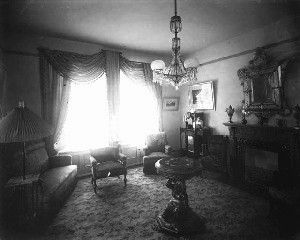 Inside, there was usually a lavishly decorated parlor, hence the name “parlor house.” The walls were flanked with sofas and chairs and often a piano stood in attendance for girls who might play or sing requests for customers. The larger places were likely to include a game room and a dance hall. Between assignations, the women and their callers were entertained by musicians, dancers, singers, and jugglers. The girls’ rooms were always on the second floor if there was one. Parlor houses would usually average six to 12 girls, plus the madam, who entertained only those customers she personally selected. First-class places set a good table and prided themselves on their cellars, offering choice cigars, bonded bourbon, and the finest liquors and wines. Customers could enjoy champagne suppers and sing with the girls around the piano. In very high-class parlor houses, the women could only be seen by appointment. The lower grade of bordello came to be called a “honkytonk,” from a common southern African-American term. In these houses, there was very little subtlety. The direct approach was standard with maybe a five-minute dalliance at the bar, then it was off to her room. Lower than even the saloon prostitutes were those who worked independently, living in small houses or cabins called cribs. Crib houses were usually in segregated districts with a front bedroom and a kitchen in the rear. Often they were illuminated by red lamps and or curtains. Some madams kept a string of “cribs” available for women no longer employable within the house, continuing to make a profit off of the older painted ladies. 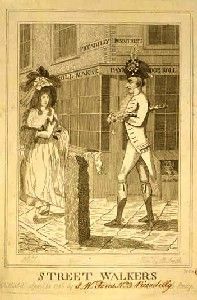 Below even those, were the streetwalkers, usually only found in the larger cities. Inevitably, painted ladies had children, though attempts were made at birth control which was very primitive at the time. By the 1840s women could purchase Portuguese Female Pills (an abortion pill) or Madame Restell’s Preventive Powders, but it is unclear how effective these were. The French had already invented the condom, fashioned of rubber or skin, as they are today. In places like New Orleans or St. Louis, where there was a large French population, condoms were readily available. However, much like today, many men were reluctant to use them. After 1860 diaphragms were available, as well as douches compounded from such ingredients as alum, pearlash, red rose leaves, carbolic acid, bicarbonate of soda, sulfate of zinc, vinegar, or plain water. Others simply relied on the rhythm method. But, the most common form of birth control was abortion, which had also spread as a form of birth control to even the “respectable women.” In the years between 1850 and 1870, one historian estimated that one abortion was performed for every five to six live births in America. ©Kathy Weiser/Legends of America, updated November 2018.